A contestable market is a market structure where there is freedom of entry and exit. It is a market structure which must have low sunk costs (non recoverable costs e.g. advertising). In a contestable market the number of firms is not so important. What is important is that the threat of competition should be sufficient to keep prices low and prevent abuse of monopoly power. 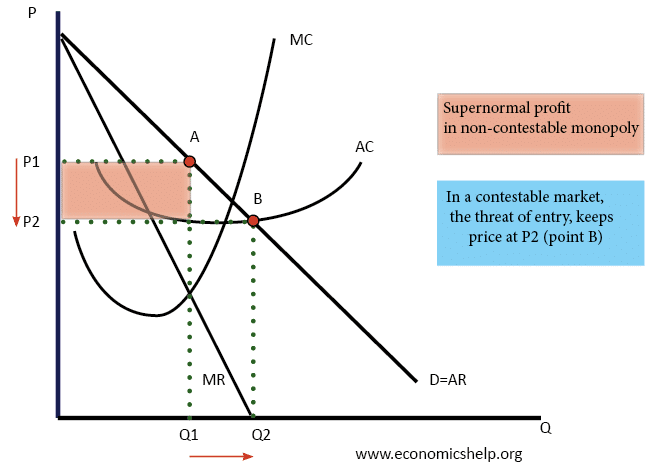 A contestable market has the potential for hit and run competition – where people enter temporarily before leaving once supernormal profits are exhausted. In practise few markets are perfectly contestable; but, there are different degrees of contestability.